Paul Thomas Anderson's The Master (Best Actor, Supporting Actress, Supporting Actor) is...well, masterful. What Anderson freely admits, and the actors deny, is that it is a meticulously researched story of L. Ron Hubbard and the cult of Scientology. In addition to the available literature, Anderson unearthed pamphlets and other contemporary ephemera that came out of Scientology circa 1950, but the cast, fearing harassment from the ranks of the faithful, have insisted that no parallel is intended. That said, it is important to realize that the film is not a standard biopic. Its source material may be Hubbard, but the film has a propulsion it could not have achieved had Anderson set out to do nothing more than tell the story of Scientology. Every actor in the film delivers a virtuoso performance. 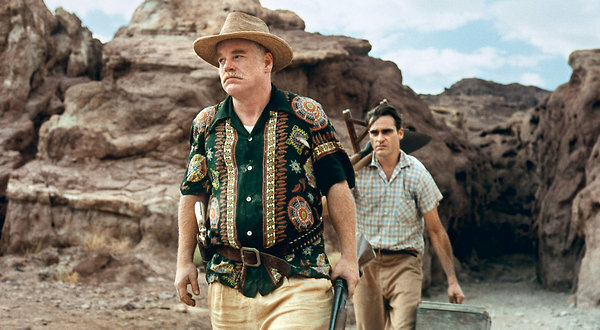 Philip Seymour Hoffman's megalomaniac Lancaster Dodd is a self-deluded narcissist, the center around which his self-made constellation revolves. Joaquin Phoenix plays the alcohol-/chemical-deranged Freddie Quell (whose mother has been institutionalized with schizophrenia). (If there is a wee problem with the casting it's that one could say Phoenix has been type cast as the self-destructive persona of his documentary hoax I'm Still Here, though Quell is the victim of his demons, not the author of them.) Phoenix's performance is physically wrenching juxtaposed against Hoffman's beady control. Both men give powerful, nuanced performances, but, as the projector rolls and this magisterial film builds momentum, we come to realize that at its center, the true mover and shaker is Dodd's wife (his third) Peggy, played with equal certainty and nuance by Amy Adams. Dodd may manipulate his gullible followers, but Peggy is Dodd's sly puppeteer. She knows exactly to what extent she will allow Dodd to feed his habit for power and control with his new pet project, Freddie Quell. And she knows exactly when it is time to intervene and withdraw the drug. She is like the queen who will stop at nothing to see her son made king, the mother lion defending her cubs. 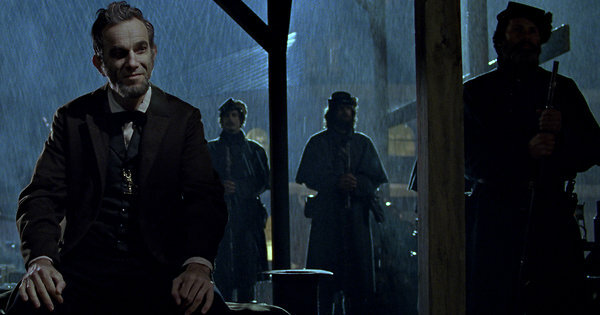 Daniel-Day Lewis, David Strathairn, James Spader, Hal Holbrook, Tommy Lee Jones, John Hawkes... distracted, I started to wonder which big-name actors would NOT appear in Steven Spielberg's Lincoln (Best Picture, Actor, Director, Adapted Screenplay, Supporting Actress, Supporting Actor). I was also annoyed that virtually every African American in the film was expected to look supplicatingly at all the nice white people. I was gratified, therefore, when, after the onslaught of laudatory reviews, I ran across a critical opinion in The New York Times editorial pages by Kate Masur, associate professor of history at Northwestern and the author of An Example for All the Land: Emancipation and the Struggle Over Equality in Washington, D.C. The film is determined, she argues, "to see emancipation as a gift from white people to black people, not as a social transformation in which African-Americans themselves played a role." Masur informs us that, "In fact, the capital was also home to an organized and highly politicized community of free African-Americans, in which the White House servants Elizabeth Keckley [played by Gloria Reuben in the film] and William Slade [played by Stephen Henderson "as an avuncular butler, a black servant out of central casting," says Masur] were leaders. Keckley, who published a memoir in 1868, organized other black women to raise money and donations of clothing and food for the fugitives who’d sought refuge in Washington. Slade was a leader in the Social, Civil and Statistical Association, a black organization that tried to advance arguments for freedom and civil rights by collecting data on black economic and social successes." "Lincoln is a movie that makes viewers feel noble at first, but on reflection the sentiment proves hollow. This is not only a hackneyed film but a mendacious one. Like other Spielberg productions, it drops you into a world where all the great moral judgments have been made for you already -- Lincoln is as absolutely good as the Nazis in Raiders of the Lost Ark are absolutely bad -- and then it smuggles its tendentious political payload through amid those comfortable stereotypes. "If you really want to explore compromise, corruption, and the ideology of money-in-politics, don't stack the deck with aces of unquestionable goodness like the Thirteenth Amendment. Look the monster in the eyes. Make a movie about the Grant Administration, in which several of the same characters who figure in Lincoln played a role in the most corrupt era in American history. Or show us the people who pushed banking deregulation through in the compromise-worshipping Clinton years. And then, after ninety minutes of that, try to sell us on the merry japes of those lovable lobbyists -- that's a task for a real auteur." Spanish director J. A. Bayona's The Impossible (Best Actress) is an international effort and utilizes digital imagery as well as old-school modeling and editing techniques to reproduce the devastating tsunami that, in 2004, pummeled 14 countries the day after Christmas. It pinpoints our gaze on the true story of a single family vacationing in Thailand, all five of whom miraculously survived. The film could so easily have tipped into the sniffling realms of Hallmark Hall of Fame land, but thanks to deeply felt performances, most notably Naomi Watts as the critically injured mother, it rises above its based on a true story-disaster movie origins. I have to agree with A. O. Scott, however, that "the terrible effects of the tsunami on the local population are barely acknowledged." Somewhat like the slaves of Spielberg's Lincoln, the few Thai characters presented in The Impossible seem to be there simply to serve the tourists. I attend a Sunday morning class at my Unitarian Universalist Church where we are entering the final nine weeks of a 36-week lecture series from The Great Courses DVDs, Why Evil Exists, with a wonderful lecturer, Dr. Charles Mathewes of the Universities of Virginia and Chicago. As a UU church, many points of view are represented in our discussions after the lectures, and one among us is a self-professed Libertarian who hews to an Ayn Randian brand of self-interest and greed-as-good. A couple of weeks ago, fed up with his oft-repeated line that any action is acceptable as long as it hurts no one else, I raised my hand and said, "My very existence on this earth hurts someone or something else. I eat, I drive a car, I pollute. There is no such thing as purely benign existence, but there are all sorts of window dressings." A young woman across from me raised her hand and said, "She is absolutely correct. I served in Iraq, and my presence there shielded all of you from facing the truth that she is talking about. I was there so that you didn't have to be. When I am there you can all remain complacent and look away." This young woman's remarks echoed in my head as I watched Kathryn Bigelow's virtuoso Zero Dark Thirty. I had not expected the controversy that has arisen over the film's depiction of torture. I get the impression, overall, that our politicians, the CIA, and certain members of the Academy of Motion Picture Arts and Sciences doth protest too much. Bigelow does not make heroes of torturers; she shows them to us -- and by extension, she shows us that we are them, which is the real underbelly of the protestations against the portrayals of torture in the film. There has been no large scale popular movement against torture by United States citizens for the simple reason that as a country we really don't mind. What we do mind is having someone remove the blinkers and point our heads at it. Eric (Edward Norton): We got screwed on the intel, okay? Nobody knew those people were in there. It would be perfectly normal for a person to have doubts about the morality of what we just asked you to do. Aaron (Jeremy Renner): Is that a question, sir? Eric: No, it's not. Tune in to what I'm trying to say to you. Do you know what a Sin Eater is? Well, that's what we are. We are the Sin Eaters. It means that we take the moral excrement that we find in this equation and we bury it deep down inside of us so that the rest of our cause can stay pure. That is the job. We are morally indefensible and absolutely necessary. You understand? Aaron: Will that be all? Compared with Bigelow's film, that is a rather clumsy exchange. CIA agent Maya, in a complex performance by Jessica Chastain, does not explicate this reality. She inhabits it with single-minded focus. Without the crutch of explication, Bigelow's film puts us in the midst of the moral dilemma and forces us each to grapple with our moral complicity without herself passing judgment. That is an achievement. 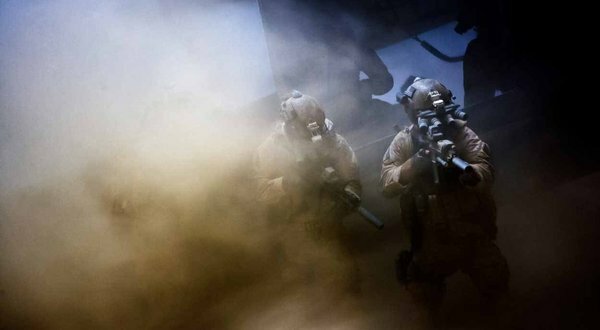 Beyond the torture brouhaha, Zero Dark Thirty is the work of an extraordinary film maker. The editing is genius. I would be fascinated to have a count of the sheer number of shots that make up the film, and yet taken together, one to the next, they give the film fluidity, a smoothly undulating rhythm that reminds us that Bigelow cites Peckinpah and the early Scorsese (Mean Streets) as influences, along with David Lean's Lawrence of Arabia and Hitchcock's oeuvre. Another notable aspect of the film is that it seems virtually score-less. For a film that runs to 2 hours, 37 minutes, Alexandre Desplat's soundtrack comes in at just under 54 minutes, and much of it is almost inaudible in the film, the sounds emanating from the action and slowly morphing into the deep rumbling of a tympani or a single sustained note from a flute or reed. 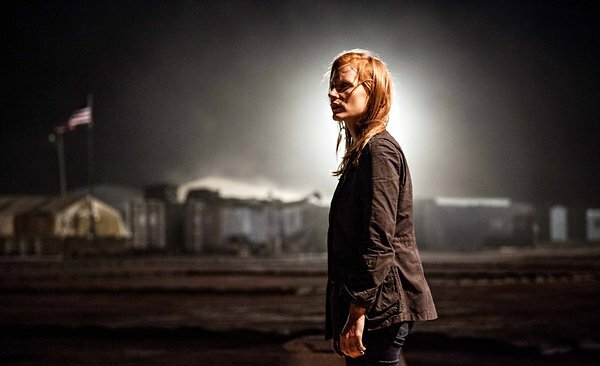 NYT columnist Roger Cohen on "Why 'Zero Dark Thirty' Works"